Today is a day of gratitude. For my long arms that could easily pass toys or snacks or fix the portable DVD player to keep my kids happy. At one time they spiked volleyballs, shot the J, and played good D. Now they are go-go gadget like contraptions for my kids! For an interesting route that provided fun stops: Kentucky Horse Park, Greensboro Children’s Museum, West Virginia Tamarack craft & art center, and a simple park in Chillicothe Ohio. For happy, sweet children who liked the journey. My daughter said, “I love this bathroom” in our first hotel. I guess the hotels were an “attraction” too. On our last day she told us she just wanted to play with toys in the car instead of go home – a traveling pro in the making. For a patient husband who helped care for high energy kids, playing games with them when I drove and keeping the peace. For a spontaneous hug from both kids this morning when we were all home and enjoying a lazy breakfast together. For the post it note decoration pictured in this post. My daughter made it for my son’s birthday. ..in September! He ripped part of it down already, but such a nice gesture! For our home and where we live. ..and for feeling like we can successfully take more fun family trips again soon. This entry was posted in home, Kids, Motherhood, parenting and tagged gratitude, kids, road trips, thankful, travel by Cathy O. Bookmark the permalink. It’s really nice to have good travelers. When they’re little it seems impossible. I’m thankful for a relaxing start to the spring. Reduced work schedule, and my husband is on break from grad school = more family time. I know it could have been SO much worse with a 3.5 year old and 20 month old. I figure we just had to do it and try it out. It was great family time for a cousin’s wedding! Glad to hear you have more family time too. Enjoy! Wow! That is a long trip with such little ones! That’s great that they did so well! Where did you go? I loved the reference back to go-go gadget!! We went to Greensboro, North Carolina, first driving through Kentucky on the way there and then back through Ohio. Kentucky seemed to have more kid-friendly things to do, though we had to balance the time spent at stops vs. driving and making actual progress to NC. Yeah, I thought go-go gadget was the best way to describe how I had to contort myself & stretch to reach the back seat all through the trip! I am in the habit of saying to my daughter that I need Go-Go Gadget arms in the car! 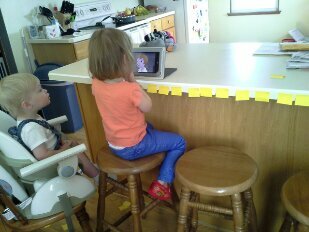 So funny that Inspector Gadget has influenced our role as moms, huh? I am really impressed that your kids did so well! We have done 3-4 hour road trips and the girls do pretty well, but I am not sure about that distance. How much did you stop? Yes, you have to love the cartoons we watched growing up! I was impressed too…we watched dvds, had snacks/lunch, played and stopped every 2-3 hrs. When my son napped, we tried to drive for as long as we could. 8 hrs of driving and about 10 hrs with stops was as far as we made it (10am till 10pm). 4 hours was as long as we’d gone prior to this trip. My attitude was that we just had to try it out! Oops, I mean 8 hours of driving in 12 hours. We could have driven more, since the kids fell asleep, but we were tired too! I think your children are close to the age of mine – 3.5 and 20 mos. Is that right? Good luck on any long road trips you may take! Awh- nice! I am at the point where I feel like it’s getting easier, and our successful road trip was just another good step in the right direction! It is a really fun time to see the world through their eyes. This was such a sweet post. Your kids will remember it always. I am thankful I stopped here today. Awh, thanks. I hope our family travels will always have some good memories. Your blog records a lot of great moments too!